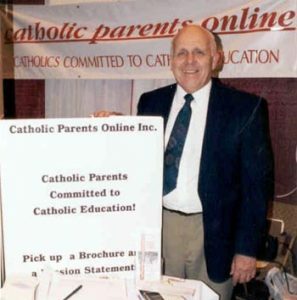 In memory of our dear friend and CPO Board member, Art Herkenhoff, who was a great defender of our Catholic faith and protector of the Holy Eucharist. May the Love of Almighty God bring you into His Glory and grant you eternal rest and peace. Amen. On October 31, 2004, we lost a true Soldier of Christ, Art A. Herkenhoff. On the Eve of All Saints Day at 10:00 PM, a Mass was celebrated at St. Agnes Church, St. Paul, Minnesota in reparation for the sins against the Eucharist. At the Consecration of the Holy Mass, Art gave his last breath to enter Eternity. Art will be greatly missed. To defend Church, family and the Eucharist, Art was a willing soldier witnessing on the front lines where trendy philosophies and practices threatened Sacred Tradition and Holy Scripture, where issues of false teachings, dissent and desecration occurred, yet consistently, he presented a compassionate heart for everyone involved. He will be remembered as a steady foundation in multiple projects, but most of all, he is a hero. * Upholding all that is true, noble, good and pure, everything that we love and honor, and is worthy of praise (Philippians 4: 8,9). * Defending the Faith is not easy yet through sufferings we endure, we act with sound character, maintain hope and never disappoint (Romans 5: 3-5a).